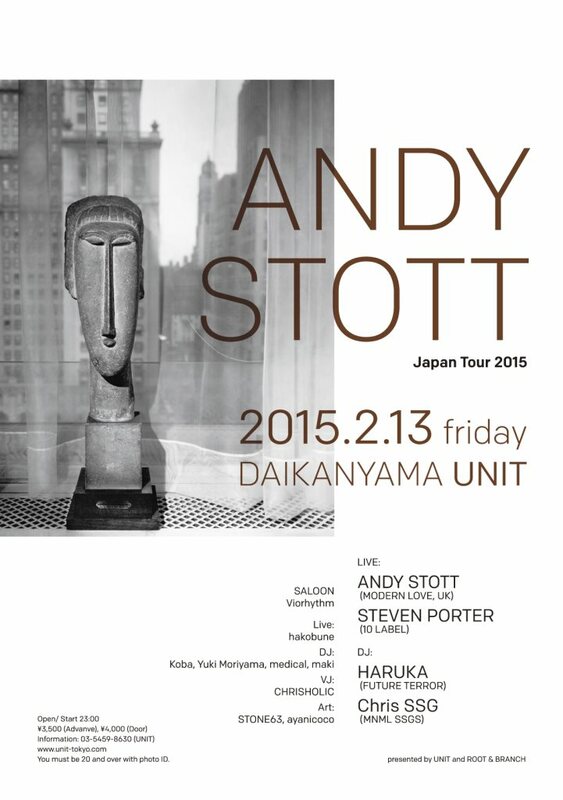 I am very happy to announce that I will be playing at the Andy Stott party at Unit on Friday 13th February. It is shaping up to be an interesting night of weird techno music. As for the lineup: I don’t need to say much about Andy Stott, he’s very well established these days. Supporting him will be Steven Porter playing live. They are based in Kansai, and don’t play in Tokyo very often, so this is a great opportunity to see them. I’ve heard good reports about their liveset. And rounding out the mainfloor will be Haruka from Future Terror. I really feel he has progressed a lot with his DJing over the last 6-12 months and is now firmly establishing himself as one of the best techno DJs on the Tokyo circuit. I am very excited about this gig: I am looking forward to playing again on Unit’s killer system and given the curation of the event, I think there is a lot of space for me to go heavy and weird. So come down and join me for what should be a provocative and worthwhile night of techno music.